Shaving with a D’E razor gives me a lot of joy. Although choosing a specific one has had it’s pitfalls. Firstly I got caught out with buying for looks and not practicality. Which is such an important factor particularily if you are new to D’E shaving. Technique is also something we urge our readers to revise. The following post I hope will cater for some of the questions you may have when buying a safety razor. Firstly I would consider the fact, wether you are a beginner, novice or experienced. The following categories should help you decide which style razor you would benefit from. Another factor is how your hair grain is, soft or hard. Also how often you shave, this is a key factor. The modern style of having a few days growth will affect the efficiency of certain safety razors. Skin type is another factor you should consider in buying a razor. I found these later in the shaving game but now I use one regularily . A new shaver would beniefit from there smoothness. These are Ideal for the everyday shaver who want’s to take of that morning stubble. These are good up to 3 days growth after i find there is a little snagging. But they are great razors to practice advanced shaving tecnique with, like the J turn. Razors to consider are the Fatip Gentila and any Feather razor. I have also recommended these to gentlemen who have soft skin for obvious reasons. I would say moderate grained courseness men to light, will suit these safety razors. But the heavy bearded gent will really need to employ every day shaving to avoid snagging. These razors also benefit from a sharp stiff blades like feather. Although I have had great results from sharp flimsier blades like Crown. The middle ground and most common of razor styles. They are recommended to new D’E shavers when they are learning the ropes of shaving, and don’t know what they really want from a safety razor. I went to non aggressive after, but I still use my middle with great results. These are adequate for most types of beard growth. Also perfectly fine for an everyday razor but you must revise technique as they are that bit less forgiving than the non aggressive. Examples of middle aggressive razors are Muhle, Edwin Jagger, and Geissen and Forsthof. Home brand blades are often perfect for the razors. There is no reasons for a beginner to buy one like I did. Referencing my first paragraph, I bought the feared Muhle R41. This caused me a lot of pain, I was going to jack in D’E shaving all together. As these take weilding some skill, and for the shaver to have certain physical elements. These are a tough dense grain as some men will get frustrated with the less aggresive razors. Also the tougher skinned man would benefit from using one of these. Open comb razors are aggressive they also cater for the gent who irregularily shaves, the comb gets the hair into shape before the cut. Fatip have some excellently priced aggressive razors. If you have a razor like this and want to tone it down, try a smooth blade like Derby or Shark. Now we think that middle is a great place to start for anyone. You may have even found your rightful place in the middle ranks. Although some may find themselves leaning towards the non aggressive like I did. Also the same with those of you who feel they would benefit from a harsher razor. Never get frustrated with Safety razor shaving, revise technique and always adequately prepare your skin. We hope this article has helped you on your shaving journey. We were lucky enough to have a slightly modified version of this article in the amazing Sharpologist blog. Edwards traditional shaving emporium has a great range of the several categories, so why not click the link below. Muhle shaving culture is a wonderful thing. Now taking a life style ethos also in recent years. They have really embraced Germanies rich design history. If you take into account the new Hexagon range designed by the Berlin based designer Mark Braun. Who is a bohemian new age designer of furniture and also watches. Now he has been comissioned to make a safety razor range along with shaving brushes and shaving sets. The Hexagon range is made of anodized aluminium, and chrome. This process lends an Irradecent sheen to the shaving products. A lot of thought went into the colours being several of which. Forest green, Bronze and Graphite. There is a dull matting to the Graphite which is quite unique. Also a striking element is the shape of the handles, being hexagon hense the name of the range. I was intrigued although sceptacle about the ease of shaving but it seems to aid the process, as opposed to wet chrome that is sometimes slippery. The hexagon range barrels are flat and with the matt finish it creates a great grip. The head and body of the razors are well engineered when screwing it together it feels like they are one of the same component. All handles in the range are stamped with the Muhle name, but also the companies coordinates. Which lends it a fantastic military vibe. Muhle have put emphasis into fiber brushes in recent years, making an ethical option for those who realize shaving with a brush is far better than foam. They also might have modern ethics around the fur trade. Therefore the Hexagon range has a vegan dopelganger being that you have an option of silver tip or fiber brushes. Also the knots are changeable by a screw mechanism, which is unique to any shaving brush on the market. I am not to bothered about this as a feature though as the silvertip brushes last well over the decade, Therefore I’m sure the synthetic counterpart will be basically bomb proof. Also as a non disposable plastic also don’t worry about any of it ending up in the water system. The stands are unique to the Hexagon range, and stainless steel. It has an unusual angle of holding the razor and brush pictured. This is also somehow quite a compact set, as it doesn’t take up to much space. I can understand Muhle’s decision to move into the realms of modernist design. As In our experience the Hipsters or super cool under 40s, don’t really care what they shave with. Our data shows this. Also the Hipster craze of the beard warrents no safety razor. The Hexagon range is marketed at the style conscious shaver or maybe even to convert. The Hexagon range is akin to the Bauhaus design movement also from Germany. Although it is now 100 years old the design school made products to be futuristic. So now we have in a way finally caught up. I have lots, I started with just one. The too aggressive Muhle R41, for beginners anyway. My Immature technique crumbled under It’s tyranny. To set the scene I was pretentiously shaving in the bath with a mirror. Imitating a WW2 Spitfire pilot perhaps. On the the first stroke I rammed the relatively unprotected D’E blade into my Jugular, resulting in a Inch long cut. I lept from the bath and grabbed a styptic stick, which I poulticed into the turning black wound. I relaxed for the rest of the day and kept an eye on it. This will come with time, I am now after 10 years passed novice. I have also done a great deal of research on shaving. I honed my technique with a non aggressive razor being the Fatip Gentila. Also this razor allowed me to practice more expert moves like the J turn. Being a J movement and almost a drag accross a cheek or chin. I now use a middle aggressive razor being the Edward’s lifetime razor. I realize I am biased, but the Edward’s lifetime razor is a powerful ally in my shaving armoury. Also I often go back to my Gentila on weekdays, when I have a little growth as I shave every day. I may do this in the mornings. I often use the Edward’s razor but late in the evening, this will provide me with such a close shave It will do for the next day. This means I can shave with luxury In the evening and not shaving like a mad crazed ferrit at 6.45 when I need to be on the 7 oclock. I have 4 safety razors which I use. 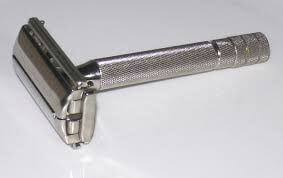 My primary for some time was the Muhle R89 safety razor. This is Muhle’s best seller, and for good reason. It is a rather beautiful object which is somewhat ornate. It is also practically a great razor. The standard Muhle head gives a really solid shave. It is also a great beginner razor as it is not to harsh. I still use my R41 from time to time when I have come back from a music festival perhaps. As the comb will manipulate any hair length into shape, although I do it with great caution. My Gentila is a great razor which I love a very drunk man could use one with safety It also looks great. The Edward’s razor Is what It is a real power house with loads of blade but somehow very safe. The Crux of my point is it’s great to have a range of safety razor’s. I would also recommend a gentle razor or middle for your first. Which Safety razor blades should I buy? There are so many. So lets look at your options which we have categorized. Now this is our opinion, we have used a safety razor for some time. Also we have worked in the barber industry. This leaves us with what you could call shaving experience. Feather is a prime example of this also Muhle blades. Although muhle and feather make different style razors. Feather being non aggressive, and Muhle safety razors being aggressive. I would not recommend either with a shavette as they need a bit of bend. 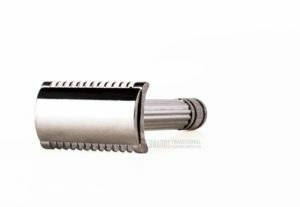 A safety razor user should expect a solid consistant shave, although this style D’E safety razor blade is not so forgiving. So I would recommend them to a more experienced safety razor shaver. Or perhaps the heavy bearded. Lord and crown are prime examples of which there is a pliability about them. They using a good light safety razor technique, are great for a first time safety razor shaver. Or perhaps someone who has bought an aggressive safety razor and want’s to tone it down a little. A bend in the blade makes these razors more forgiving than the previous heading. Most of the Industry is now based in Egypt, also wilkinson sword. Which have moved there in recent years which can also be classed as thin and sharp. Derby and shark safety razor blades are two good examples of this. We would recommend these to an every day shaver, who is just starting of with safety razors. They are a kinder shave which are forgiving. Barbers who also use safety razor blades in they’re shavette should consider these as professional blades. As they are considerably more forgiving and when you have a customers this is important. We have heard of companies having issues with sharper blades cutting customers. Which have ended in lawsuits. The best way to find a safety razor blade which suits you, is to experiment. We at Edward”s have 9 varieties to choose from. There are also other things to consider. Very important things. Firstly if you have a really rough grain of stubble you perhaps should be going for the sharp razors. Also if you have moist soft skin it is our recommendation you go for the smooth variety. 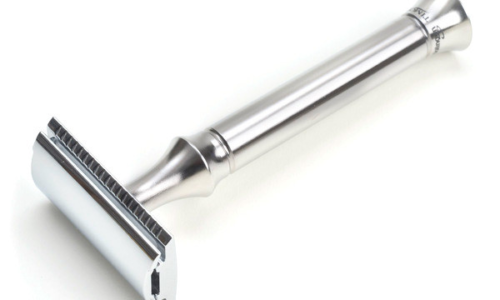 Safety razor blades are inexpensive but choosing them can be tricky. So we hope this review has helped somewhat. We also realize choosing a safety razor can be tough which is why we have a broad range of styles that cater for different men. Also price range can be something to consider, but price doesn’t necessarily represent quality. We have some exceptional lower price safety razor brands with great build quality and engineering. 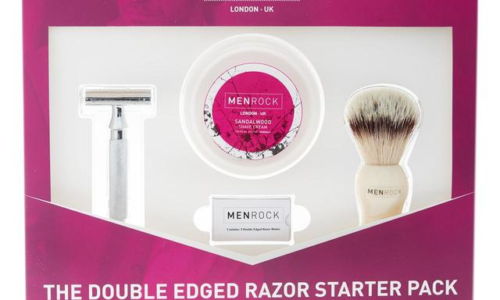 The Men rock safety razors starter kit review, by Edward. After seeing Men rock from a far, we decided to get into contact with them. Also knowing that they sold safety razor we, after a chat with management have been asked to write a review. So here it goes. Firstly the razor looks great. 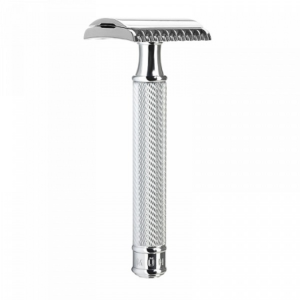 The use of knurling in the design is modern and powerful, it also provides the shaver a firm grip. This stainless steel razor is on the closer side of gentle to middle aggressive, which makes it a great every day razor. Two passes were very easy, I feel that with the men rock razor you can really take control of the shave without fear of cuts. But still getting the necessary closeness needed for efficiency. The blades provided are the Men rock home brand, which were firm and sharp. Close to something like Muhle blades. Ten points for realistic looking faux badger hair, I had to check and double take. The handle is plastic and relatively light, but my favourite feature was that it was a great exfoliate. It really pummelled my pours. Also it provided a more than adequate way to whip up lather. This smells great, and is more of a professional level cream which a barber may use. Using a hot wet brush, I activated it in a bowl and then some more on my face. Then I coated it on as if it were emulsion paint, it was really that thick and firm. This was truly a satisfying shaving cream to use, throughout the day I got the odd scent of pomegranate and my skin feels great. All and all I am happy with the what you get for the price, which is far more than £45 worth. Still I am really buzzing over the high quality cream, Excellent. For more information on razor Rock why not click the link for the rest of they’re range. Men rock safety razors starter kit review, by Edward’s. This is an Iconic safety razors list for DE safety razors. We are leaving out roller strops and single blades, due to how many D,E razors there are on the market today. Also looking back it’s amazing to see the most common style is how it all started. That’s right with the trusty 3 pc safety razor. The Gillette New, made in 1930 must have been quite the talking point. Shaving with this open combed razor must have revolutionised shaving. Brass being the material is also a heavy choice, but a mark of quality. The screw mechanism screwed the cap together holding the blade in place, and Gillette already had the market coined by making the only D,E blade. We guess that it was not patented nor were D E blades. Which is unlike Gillette who are known for being tough in business. 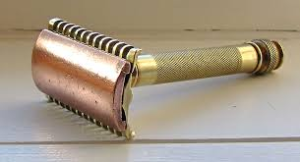 Then came the Gillette tech in the 1940s, the worlds first closed comb safety razor. Probably due to the lethal cutting record of the New. Now still a 3 piece the material was steel which was gold plated. Rather snazzy, also the mechanism differed as there was a bolt that fastened a screw running through it. The next safety razors that came in. Was the Gillette super speed in the 50 s, also called a butterfly razor. A mechanism parted the head in two, were you inserted the razor blade. It’s satisfying to watch the mechanism of this stainless razor, although I have known these to break. The Gillette Fat boy was the next on the scene, it was adjustable so you control the aggressiveness. Incredible stuff really. This has made way for many like it in recent years. There was a few Fat boys brought out with different designs. This razor inspired the Merkur Future, a rather lovely designer razor. Safety razors and there development by Edward. 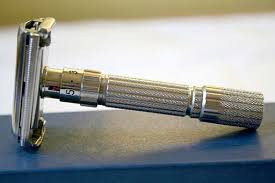 The safety razor was first patented in 1888 by the American Kampf brothers. Also the difference from today’s was the actual blade was non disposable. Therefore the owner would have flicked up the guard and honed it on a block. The safety razors guard as pictured would have been quite distant and exposed a great deal of blade. I would like to get my hands on one to experiment but with a great deal of cation. I would imagine most people would have cut themselves less with a straight razor but hey! That’s development. Ironically Jack the ripper was at large in foggy London at this time, only if he considered the emerging safety razor industry there would have been considerably less damage to the community. In 1901 King Gillette, King was his first name although he was the king of shaving. 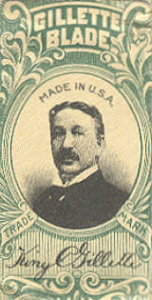 As he produced the worlds first disposable safety razor blade. Which was a single blade. The Kampf brothers developed there razors in accordance with this. The difference being from today’s safety razor blades is they were single bladed. Although you can buy single bladed safety razors which made a come back a couple of years ago. King Gillette realised the potential market with the coming war, as a shaven face fitted a gas mask better. So were commissioned to provide the united states army with a razor and blades in a field kit. This savvy man was soon a millionaire. DE blades and TTO safety razors. Double edged blades came around in the 30’s simplicity at it’s best. Now blades lasted twice as long. Safety razors still are using the 3 piece design today. With the mentality if it’s not broke don’t fix it. 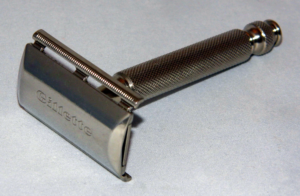 In the 1960 s the safety razor blades were carbon steel, changing then to stainless. Probably due to moisture staining. Also TTO or twist to open safety razors were invented. Which was a rather wonderful opening, with a twist and a butterfly parting although they look nice the mechanism can break. 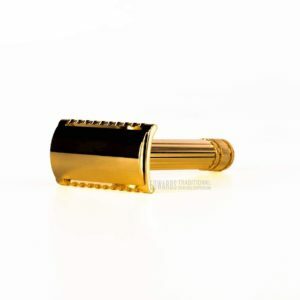 Unlike the bomb proof screw cap safety razor. Gillette in the 1960’s also invented the Adjustable. With a 1-9 adjustment which was quite brilliant in fact. This was copied by the Merkur Futur in the 1990 s. This is and still probably always will be the height of safety razor design. Unless any readers fancy having a go at being an Inventor. There has been more emphasis in the last 10 years on non aggressive razors, from which the scale was described in some of my previous posts. Which safety razors should I choose? Which safety razors should I choose? the first question you should ask yourself Is not necessarily, which one can I afford? It should be, which level of aggression should I go for. Here are the several groups along with examples. Usually but not always with an open comb, these will take any amount of hair off. But might be a bit ruthless for the everyday shaver. Here are a few models noted for aggression. Muhle R41, Fatip classic, the Ikon B1. Note that some men have very coarse hair, which makes these razors useful. Most safety razors are in fact middle aggressive. These closed comb razors are considered the best all rounders. For length, coarseness of hair and how often you shave. A lot of modern safety razor manufacturers, use middle aggressive as a standard. 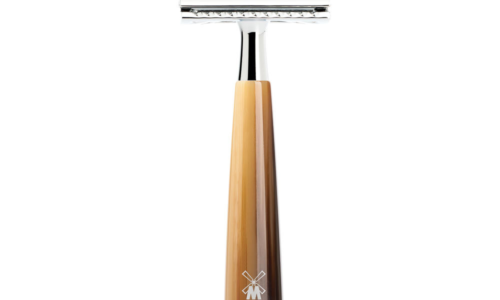 Razors to consider are any Muhle any Timor and our home brand, The Edward’s lifetime razor. Edward’s has spent a lot of focus on this style of razor over the last year, as we have found that It is a great way to every day shave. It’s quick to whip off stubble and they are relatively forgiving. These are easy and dynamic to use, it’s always good to not have a blunter side of razor as they won’t adequately work. There Is something satisfying about using one though. Razors Include, The Fatip Gentile, the Feather AS-D2. We shave a lot, we sell safety razors for a living. We try to cater for every customers need. Also sticking to a keen trust policy, we have not yet let down a customer. Despite having some tricky ones. We love to talk razors and will answer any questions you may have on them. Our lines are open for you to ask. Which safety razors should I choose? We also have a solid amount of information on shaving technique on this fine blog, which we are so very proud to administer. Most safety razors are middle aggressive on the scale, usually with a closed head. If you own a safety razor you probably have one. How should I use safety razors? I was asked yesterday by a client how to shave best so, the following post is a template for you to use for a consistent shave which limits any cuts. I would recommend two passes In most cases, I use a safety razor most day’s and this process usually has good results. A good shaving oil is helpful we sell Osma, apply it dry as a pre shave. Piping hot water on your beard is then a great way to lubricate and to soften your stubble. Then a good shaving cream applied with a hot wet brush Is best. circulate a lather on your face then paint it on. No long strokes, like you would with a cartridge razor, use small strokes which are light. On your cheeks you can apply some blade buffing, which Is when you push the razor back and fourth. Every where else I recommend lifting the blade off with every small stroke. The same principle as share with a sculptor, you are in danger of going under to far if you don’t take the blade off the surface. Don’t puff your cheeks, loose skin is best. How should I use safety razors? Puff out your neck by pushing your head back, push your chin down. Creating the bullfrog technique. The throat and chin are hard parts not to cut. By making skin bulge this makes a boyency which acts as barrier. 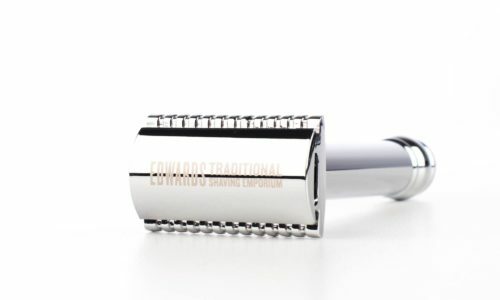 We sell a great everyday razor, the Edward’s lifetime razor Is a well priced great shave. Link attached. Get Into touch if you need any more Info on shaving. Where can I buy safety razors? Where can I buy safety razors? Edward’s places product emphasis on safety razor. We have around 50 in stock for your choosing. We had a tricky call yesterday when a customer explained he had a condition that made his blood thin. Also making him bleed profusely. He was keen for the look of a Timor vintage, as seen In the Independent featured below. Although the 1360, I explained to the client that he would be better off with a non aggressive razor, as the 1360 was not aggressive but middle on the scale. I recommended the Feather AS-DS2 a rather lovely Japanese non aggressive razor. Also I chucked In a styptic pencil, one of these helped me out once when I was using a very aggressive razor In the early days. Some people are thick skinned and have the gnarliest of growth, to them I would recommend an open combed razor. We sell the Muhle R41 and also the Fatip classic, both aggressive. 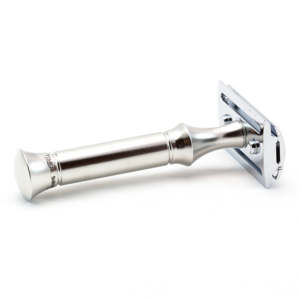 The Edward’s home brand razor Is middle aggressive, we offer wholesale on these. It Is on the aggressive side of middle, but there Is a flexibility In the way the blade sit’s. It provides a close but gentle shave, despite really dominating the hair. Muhle closed combs razors and also Geisen are mainly middle aggressive, these make them a good first time razor. Also an everyday razor. 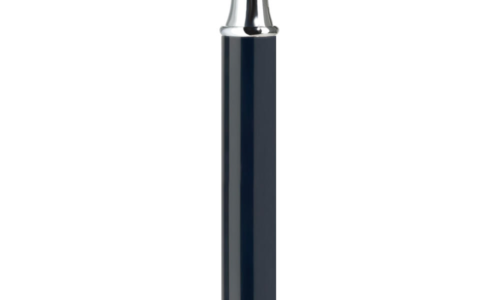 A cheaper alternative to the Feather Is the Fatip Gentila, It’s a real lovely looking razor. Also a well priced razor that will give you a non aggressive shave. Where can I buy safety razors? at Edward’s. Where can I buy James bonds razor? Where can I buy James bonds razor? Well at Edward’s of course. In 2012, we noticed a steep rise In straight razor sales. By 2013 It had risen as much as 300 percent. 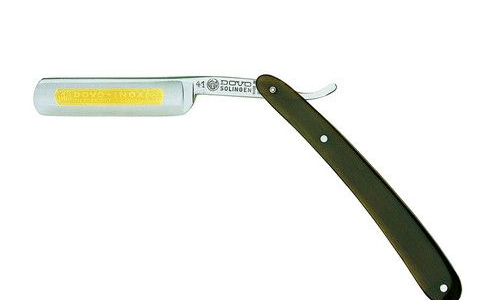 With some research, we found that It was down to 007 using a Dovo straight razor In skyfall. Although It Is not surprising that this childhood Icon of mine could have created such a change In sales. Last year the James Bond lifestyle company got Into touch, and wanted to buy and feature the razor. However the handle Is horn, this makes a variance In the colour. As pictured, Bonds razor Is dark, and Sadly It Is the luck of the draw. Plastics are a hot topic at the minute and for good reason, as the seas are swimming with the stuff. Also things like exfoliation pearls have made there way Into fishes stomachs and onto our plates. For example shaving Is a consumer Industry which will sadly add to this. If each Industry keeps It’s side of the street clean we will be able to change the circumstances. Traditional shaving Is a considerably more environmentally friendly way to shave than with modern cartridge blades. Due to the large lump of plastic that holds the four three or two blades together. Double edged blades however, are Just thin sheets of stainless or carbon steel. Some come in plastic packs but many Just plane old cardboard. A straight razor Is something else entirely If healthy renewable shaving Is your thing. Although yes It will be a longer process entirely. Shaving at Edward’s are always trying to get more ecologically friendly. Last summer your noble author when walking back from the Love box festival In London. Wearily I got home at 1 or so, In the pitch black after gallantly walking a lady home. On the approach of my country dwelling. I was snarled and hissed at, realizing what ever I could not see, could quite clearly see me. What ever It was circled me also at this time I noticed that It was of a fair size. I decided It would not be to cowardly to run away. Eventually on finding the courage to get In side I googled hissing quadrupeds and the obvious clue was a Badger. Realizing that my encounter was In fact a spiritual message. I have since taken the Edward’s badger brush off the market, and put more emphasis Into synthetic brushes. We still sell other firms badger brushes yes, but all Edward’s brushes that will be marketed are now synthetic. Yes plastic based, but they are not disposable goods. You will have one of our brushes forever.